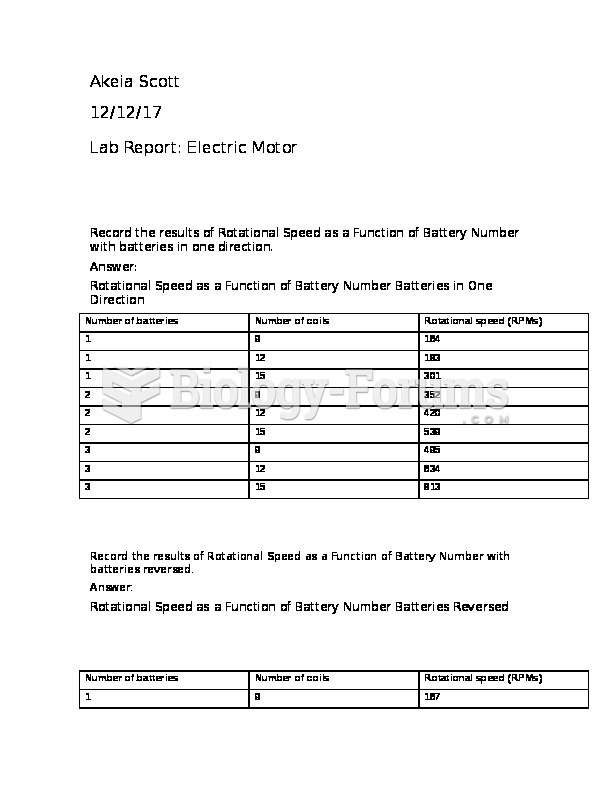 Akeia Scott 12/12/17 Lab Report: Electric Motor Record the results of Rotational Speed as a Function of Battery Number with batteries in one direction. Answer: Rotational Speed as a Function of Battery Number Batteries in One Direction Number of batteries Number of coils Rotational speed (RPMs) 1 9 164 1 12 183 1 15 301 2 9 352 2 12 420 2 15 539 3 9 495 3 12 634 3 15 813 Record the results of Rotational Speed as a Function of Battery Number with batteries reversed. Answer: Rotational Speed as a Function of Battery Number Batteries Reversed Number of batteries Number of coils Rotational speed (RPMs) 1 9 167 1 12 213 1 15 274 2 9 313 2 12 448 2 15 575 3 9 497 3 12 633 3 15 813 Create a graph of Rotational Speed as a Function of Battery Number with batteries in one direction. The x-axis should be rotational speed (RPMs), and the y-axis should be number of coils. Create a graph of Rotational Speed as a Function of Battery Number with batteries reversed. The x-axis should be rotational speed (RPMs), and the y-axis should be number of coils.